Below you’ll find a mixture of capsule/pod, bean-to-cup, espresso, and filter coffee machines. We’ve included the best coffee machines suitable for all budgets. So you’re certain to find something that’s right for you. Jump to the 15 BEST coffee machines of 2018. 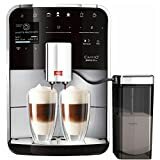 What’s the best coffee machine for me? The first thing you should know is that there are four main different types of coffee machine. Here we’ll take you through how each of these coffee machines work. Capsule Coffee Machines: If you’re looking for an easy to use, no hassle, coffee machine – then capsules are the way to go. There’s no mess. Just put your coffee capsule into the machine, place your cup under the nozzle and press a button. That’s it. The machine will grunt and moan and in a few seconds, you’ll be drinking hot coffee. The downside to capsule machines is that you’re tied into buying coffee that comes in capsules that fit your machine. Bean-to-cup Coffee Machine: These are our favourite coffee machines. They’re almost as easy to use as the capsule machines, the main difference is you have to fill the machine with coffee beans and empty the grind after you’ve made a dozen or so cups of coffee. But, the benefit is worth it. You can buy coffee beans from anywhere and put them straight into your machine. This means you can experiment and find the coffee bean that suits your exact tastes. Plus, buying coffee beans is more cost efficient than buying individual capsules. Click here to read our roundup of the best bean-to-cup coffee machines of 2018. 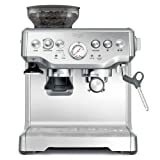 Espresso coffee machines: Another option is getting an espresso machine. These are more similar to what you’ll find at Starbucks or your local coffee shop, but on a much smaller scale. 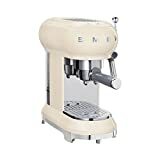 An espresso machine means you have to use pre-ground coffee beans – you can buy pre-ground coffee from the supermarket or grind up your own beans at home with a separate machine/device. Once you have the ground coffee you need to measure the right amount and then scoop it portafilter (this gets messy) and attach it to your machine. Hot water is then forced through your ground coffee and portafilter into your cup. Like I said, it’s a bit more hassle than a bean-to-cup machine, but these machines are usually more compact in size, so could be a good option if you don’t have much space in your kitchen. Filter coffee machines: Finally, you have filter coffee machines. These are the most basic of all and you’ve probably got one in your office. Filter machines work by pouring hot water over ground coffee and then forcing the liquid through disposable paper filters. The brewed coffee is caught in a glass jug that sits on a hot plate – meaning your coffee will stay warm for hours. Filter Coffee is great for when you want to make a batch of coffee in one go and not let it get cold. Ideal for small offices. The Melitta Barista TS F750-201 is a bean-to-cup coffee machine for those who want style and convenience. And those who can afford it. At £799 it’s not cheap. But what you’re getting is a fully-automatic coffee machine that will make your favourite coffee – whatever that is – at the press of a button. It knows which ingredients to use for 21 coffee specialities just like a real Barista. It knows the exact dosages that should flow into your cup, according to the original recipe. And always with the correct type of coffee bean, thanks to the ‘Automatic Bean Select’ feature. Another quirk, we think you’ll like is that is has a feature called ‘My Coffee Memory’ which memorises the coffee preferences of up to 8 individuals… and their names too. All they have to do to get their favourite brew is select their name. Did we mention the self-cleaning? The brand ‘Sage by Heston Blumenthal’ has earned an excellent reputation when it comes to coffee machines. The BES870UK is brand’s mid-range machine and is perfect if you want to make barista-grade coffee at home. It’s competitively priced too. You can’t fault the design. It looks professional (because it is professional) and its neutral colours will look great in any kitchen. It’s not the smallest of coffee units available though, so make sure its 350x380x370mm dimension fit in your kitchen before purchasing. 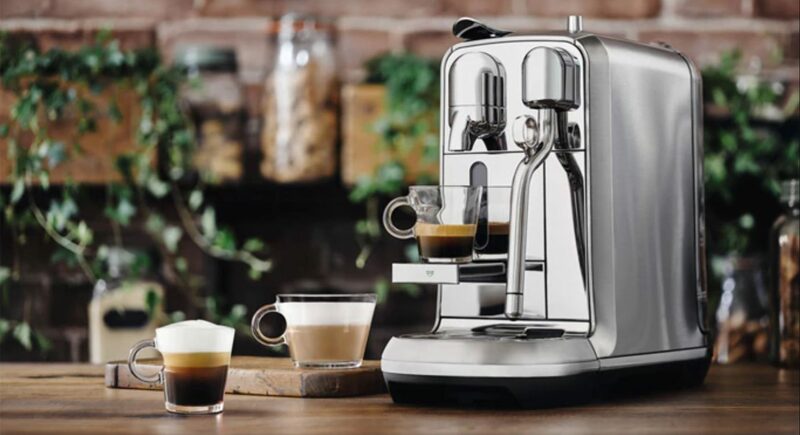 Sage by Heston Blumenthal: the Barista Express Coffee Machine is up there with the best bean-to-cup coffee machines, but costs almost half the price of some of its rivals. While its a little tricky to use at first, once you find your ideal settings, you’ll never need to buy a coffee from the high street again. Click here to read out full Sage by Heston Blumenthal BES870UK review. If you’re looking for an automatic bean-to-cup coffee machine, that looks great and is easy to use, then you’re not going to be disappointed with the Jura E6. At £695, it’s not cheap. But what you’re paying for is the latest in terms of autonomous coffee making technology. Click here to read our full Jura E6 review. The Nespresso Creatista Plus isn’t cheap, but you really do pay for everything you could ever want in a home capsule coffee machine. It looks great, pours perfect coffee every time and offers versatility/customisation that no other machine on the market does. Plus, you get to play around with creating latte art. The ideal unit for the budding barista in all of us. Click here to read our full Nespresso Creatista Plus review. 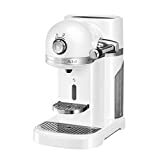 With a respectable price of £249.99 for what you get, the Krups Nespresso Expert Coffee & Milk Machine is Nespresso’s best yet. Combining sophisticated design, ingenious functionality and high-quality coffee makes this the best on the market. 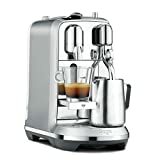 Read our full Krups Nespresso Expert Coffee & Milk Machine. Click here to read our Nespresso Expert Coffee & Milk Machine by Krups review. The Illy X1 Anniversary IperEspresso machine is one of the most expensive capsule coffee machines on the market. But is also one of the easiest to use. This machine is perfect for anyone looking to brew top grade Italian coffee. Without all the gimmicks. In the comfort of your own kitchen. Click here to read our full Illy X1 Anniversary IperEspresso review. The Nespresso Lattissima One is a gorgeous and slim capsule coffee machine that couldn’t be easier to use. It’s just as easy to maintain too. If you want to make a quick Nespresso coffee at the press of a button, there isn’t a coffee machine that rivals this for convenience. However, there is little original in this machine other than its new “no waste” milk jug. Apart from that, Nespresso itself has better and/or cheaper capsule coffee machines than the Lattissima One. But for convenience alone, there is no better coffee machine than this. Click here to read our full Nespresso Lattissima One by De’Longhi review. The sleek Nespresso Prodigio pours one of the best capsule coffees around. If you want bean-to-cup quality but from a no-mess capsule, the Prodigio delivers. However, it’s gimmicky connected functionality which drives the cost up to £160 is its biggest downfall. Click here to read our full Nespresso Krups Prodigio review. There’s a lot to like about the Nespresso VertuoPlus. Its design is beautiful and it’s very easy to use. 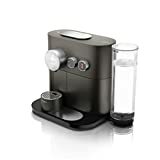 Combine this with its reasonable price fantastic end result (the coffee) and it becomes a capsule coffee machine that will benefit a lot of kitchens. Click here to read our full Nespresso VertuoPlus review. Click here to read our full Nespresso VertuoPlus review. The Gaggia Brera is a solid “first-starter” bean-to-cup machine. For a cool £1399, it’s reliable, simple to use and makes great coffee. It’s dual-capability to use both beans and ground coffee is also a selling point. If cost is of concern, then you can find cheaper machines that produce as good quality coffee, However, the Smeg ECF01’s stylish design, simple accessories and inbuilt steam wand tips it from a one-purpose utility to an admired accessory. Click here to read our Smeg ECF01 review. The Delonghi Scultura ECZ351 is basic in use but delivers on expectation. It’s sleek, retro design will compliment any kitchen and the coffee it produces delivers above expectations for its price. The Nespresso KitchenAid Artisan coffee capsule machine is all you’d expect when combining these two powerhouse appliance brands. This machine guarantees style and quality coffee. However, it’s not cheap and there’s no milk wand. Click here to read our Nespresso KitchenAid Artisan review. The De’Longhi Nescafe Dolce Gusto Eclipse Touch is a trailblazer in unique, artistically designed coffee capsule machines. While making high-quality coffee, it will also make a large and loud statement in your kitchen. Click here to read our De’Longhi Nescafe Dolce Gusto Eclipse Touch review. Read next: Best bean-to-cup coffee machines.